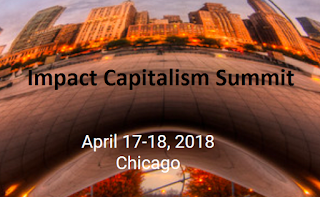 The tenth annual Impact Capitalism Summit will take place on April 17-18, 2018 in Chicago, Illinois. Referred to as the "The DAVOS of Impact Investing". The Impact Capitalism Summit is the largest convening of investors focused on maximizing impact and maximizing return across asset classes. Impact Driving Alpha & Diversity Driving Alpha are this year's themes at the Impact Capitalism Summit in Chicago. This year's conference will explore how institutional investors are finding market performance returns and better by looking at diversity as a potential source of arbitrage. "Talent is equally distributed but opportunity is not." Across asset classes, there is a large segment of our economy that is on the sidelines. Non-white, non-male fund managers, CEOs, and entrepreneurs have little access to the fuel needed to bring about meaningful innovation. Because of this, what great fund, company and investment strategy has not been funded? The Summit will explore the progress of leading impact investment portfolios, discover the latest innovations across sectors, themes and asset classes, and identify the steps needed to harness the power of capital markets to build a sustainable, fair and just economy where opportunity and prosperity are shared by all. They have created a thought-provoking and actionable agenda designed to facilitate peer-to-peer learning and encourage collaboration in a unique environment that promises to capture the imagination and inspire participation. You will hear from prominent family offices, institutional investors, and influential foundations about what is driving their impact investment decision-making in 2018 and experience an exciting lineup of discussions, debates, and performances. Meet and hear from leaders building transformational companies and leveraging the engine of capitalism for great profits and great good. Seven new speakers have recently been added. Click here for the full list of speakers. Click here to register/apply.